KIEV, Ukraine -- Ukraine's parliament erupted into what looked like a fully fledged riot this week over a controversial vote to extend a Russian navy lease. 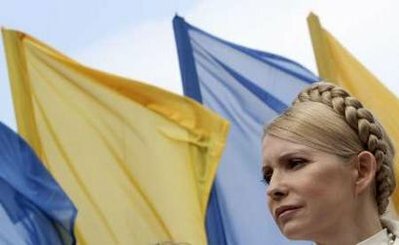 Ukraine's ex-Prime Minister and opposition leader Yulia Tymoshenko attends a rally in front of the parliament in Kiev. The treaty clears the way for the Black Sea fleet to stay in Crimea until 2042 in return for a 30 per cent reduction in Ukraine's price of natural gas imports. It also signals a dramatic return to Russia's embrace under Ukraine's new president Viktor Yanukovych. Many say the vote means Ukraine's Orange Revolution, which grabbed headlines around the world more than five years ago, is well and truly over. Parliamentary speaker Vladimir Litvin, who was forced to take refuge under an umbrella as eggs rained down on him during the parliamentary brawl, is glad to see it go. He says not a single promise of the revolution was fulfilled, and the authorities who took up office with the people's support exhibited only their corruption and ability to quarrel between each other. In fact, disagreements between the two leaders of the Orange Revolution, president Viktor Yushchenko and prime minister Yulia Tymoshenko, may be its best known legacy. But while they battled on, old rival Mr Yanukovych never went away. He won the presidency in February, beating Ms Tymoshenko, and has wasted no time in turning Ukraine back towards Moscow. Ms Tymoshenko has in the meantime re-established herself as the leader of the opposition. She spoke to ABC's PM from the middle of her fight against the Russian navy deal, calling it one more favour for the Kremlin and the local oligarch tycoons who back the new president. "We cannot allow our country to turn into a private corporation," Ms Tymoshenko said. "Put simply, that is what Yanukovych wants to do." Mr Yushchenko is also taking aim at the treaty. He may be a spent political force, drawing just 5 per cent of the vote in this year's presidential elections, but he is still lashing out at his former ally, Ms Tymoshenko. "For her, national interests are of secondary importance," he said. "The most important thing for her is to be present in politics. Unfortunately lots of disappointments were brought in via such a model." Meanwhile, activist Peetro Antyp says he can recall the time five-and-a-half years ago when hundreds of thousands of people massed in Independence Square in the capital, Kiev. He remembers the spirit that was in the air, the dreams of a new era for Ukraine. "The fact is that many issues we were standing for were not solved," Mr Antyp said. "Many people were hoping for reforms, but they did not happen. Here, there is a feeling of disappointment." After the revolution, corruption was rife and reforms aimed at establishing a transparent government floundered. Ms Tymoshenko says it is the politicians who failed, not the principles of the revolution. "People are disillusioned, not in their ideas and ideals, but in the politicians who proved incapable of turning these ideals into reality," she said. In the Kiev spring there are few signs of another revolution. Russian navy bases and natural gas prices are controversial. But many in Ukraine say after watching their campaign for reforms go nowhere, they are in no mood to try again.